Photo: Chelsea Lyon Science has helped explain why the Mobil gas station in western Goleta can get away with charging so much. 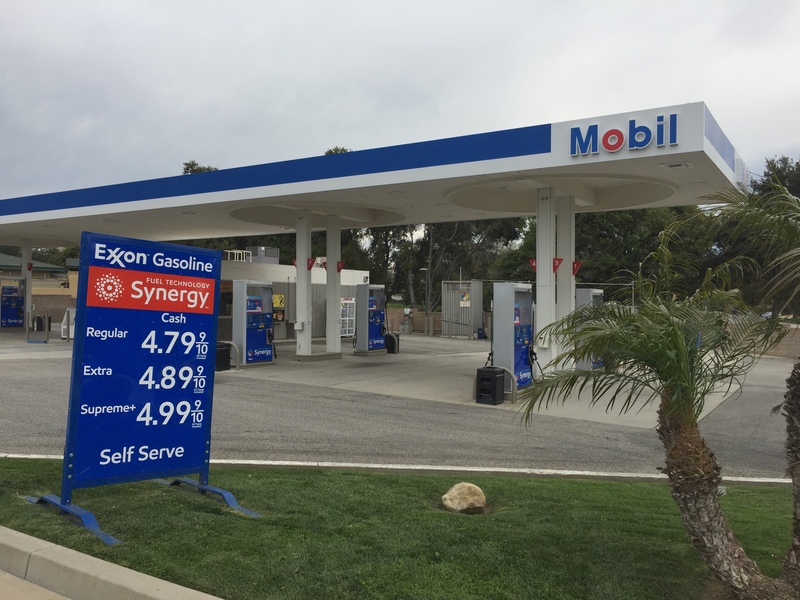 UCSB graduate student Jing Xu was driving to the grocery store one day when she stopped at the Mobil gas station on Glen Annie Road and experienced the sticker shock all too familiar to western Goleta residents. The prices were high, extremely high, nearly two dollars above any other gas station in the area. “I was really surprised,” Xu said. “I thought there must be something wrong with the sign.” So she got out of her car and checked the pump. Nope, the sign was right. “How could that be?” Xu wondered. Thus began a full-blown scientific study of why some stations charge more than others in the same geographic region, and how a few get away with blatant price gouging. Xu teamed up with geography professor Alan Murray for two weeks in 2016 to track the price of regular gasoline at 108 stations throughout Santa Barbara County, and they published their findings this January in the Asia-Pacific Journal of Regional Science. While other researchers have devoted countless studies to the global dynamics of gas pricing ​— ​how it’s affected by the cost of crude, trade markets, transportation charges, and so on ​— ​this was the first paper to focus specifically on abnormal pricing behavior in a local retail market. It was also the first to examine the phenomenon of price gouging outside of a disaster scenario. The Glen Annie Mobil location clearly exploits northbound drivers needing to fill up before the next opportunity in Solvang, Xu said, and conversely targets southbound travelers who may be coasting down on fumes. The interchange itself sees almost twice the amount of traffic ​— ​65,600 vehicles per year ​— ​compared to the county average. Not only does the station attract shoppers who may be heading to the only Costco and Home Depot in the region, Xu went on, but it also snares young drivers who may not know any better. “You have sort of a captive market,” Murray said in a press statement, referring to its location near Isla Vista, UCSB, and Dos Pueblos High School, where “young drivers maybe don’t appreciate” the discrepancy. Xu said while her paper focused exclusively on the Santa Barbara gasoline market, its methodology could be applied to any number of disciplines. “The framework can definitely be used in other fields,” she said. It’s drawn a lot of attention among geographers and led to some interesting debate about whether price gouging is unethical or merely a tool to maintain market equilibrium. “We’ve had a lot of interesting discussions,” Xu said.